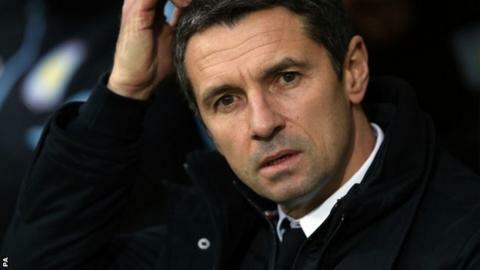 Remi Garde wants to remain Aston Villa manager even if they are relegated from the Premier League. The former Lyon boss signed a three-and-a-half-year contract in November, succeeding Tim Sherwood. Villa have failed to win any of his eight matches in charge and are bottom of the table, 11 points from safety at the halfway stage of the season. When asked if he would stay if the club were relegated for the first time since 1987, Garde said: "Yes." Villa have won just once in the league this season, on the opening day at Bournemouth, and have lost 13 of the following 18 games. "Of course I thought we would have won earlier, but I knew when you come to a club that has played 11 and lost nine you don't expect to find everything going well," he added. "If they are, you do not get the call to come in. I knew it would be difficult but now I am full of confidence for what we can achieve in this club." Villa play second-bottom Sunderland on Saturday. They are four points adrift of their relegation rivals but Garde does not believe defeat will mean relegation will follow. "It's a very important game but this is not the last chance we will have," he said.